"...The Q Brothers Collective-GQ, JQ, Jackson Doran, and Postell Pringle, joined by John Hoogenakker as Scrooge (Jason Grimm takes over the role December 12) and DJ Kieran Pereira-are chameleons who toss on personae like ermines and strip them off again like Vegas professionals. Highlights include Pringle's strobelight turn as both Bob and Martha Cratchit and JQ as everyone, especially a gymnastically gifted Lil' Tim." "...It’s a lean show, crisp and quick and often astonishing in its brash rhymes. The palpable vibe in the audience – anyway at the cabaret tables – was charged. The customers were into it. Score a success for CST’s still-unfolding Yard, which has the look of a home for the Qs’ “Christmas Carol” for many a season to come." 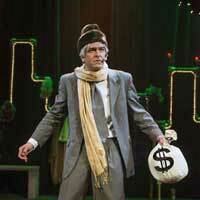 "...The Q Brothers Christmas Carol is back this season at Chicago Shakespeare Theater. Set against a chain link fence shaped in the outline of the Chicago skyline, this modern take on Dickens’ holiday classic is truly a joy to experience. Ebenezer Scrooge, played by GQ, is an old miser who is visited by the ghost of his former business partner Jacob Marley and the Ghosts of Christmas Past, Present and Future. After their visits Scrooge becomes a kinder and happier man. With an irresistible score, the originality of this piece and the insanely clever rhymes are a bold energizing kind of storytelling. " "...'Tis the season to be jolly! If "jolly" means laughing a great deal, then the spot to be is at Chicago Shakespeare Theater's YARD venue. This is the new theater between the Courtyard and the Ferris Wheel that replaced the old Pepsi Skyline. The beauty of this new venue is that they can change the configuration to fit the show. For those that have seen the Q Brothers do "their thing", they are back to bring us their updated version of Dickens' classic "A Christmas Carol". While they do tell the story, 'tis how they do this that makes you feel as if you are at a comedy club rather than the theater." "...The Q Brothers may be giving "A Christmas Carol" a heavy stylistic makeover, but the spirit of the original tale still is preserved, though with a 21st century sensibility. As usual, I found JQ's droll take on Lil' Tim comical take on the ailing little boy more entertaining and more insightful than the lugubrious "God bless us everyone" prototype. As Tim, JQ enumerates the vast number of diseases the poor brave tot endures without complaint in a hilarious bit that both ridicules and honors the character. Young Ebenezer's interaction with his blonde pigtailed romantic interest Belle in the Christmas Past segment is a continuous riff of comic surprises." "...Audiences returning to this happy holiday production will not only delight once again in the brilliance of this production, but they’ll recognize how this show’s become ingrained inside these gifted guys. Ably assisted by experienced DJ and sound designer Kieran Pereira, perched high above the playing area, this contemporary rockin’, poppin’, hip-hoppin’ musical is 75 minutes of highly energetic holiday magic, with a message that’s timeless, as well as being au courant." "...I think the brothers’ inventions, both musical and otherwise, are better left unspoiled; but I will say that highlights for this writer included one actor’s not so subtle commentary on playing two characters in the same scene, a hilarious and obviously improvised rant delivered by one performer to cover another taking too long to get into place, and Tiny Tim’s mantra-turned-anthem, here hip-hop-icized as ‘God Bless Us Errybody’ and accompanied by a thrilling break dance on a crutch." "...The Q Brothers - JQ and GQ - show off their writing and musical skills with this piece and keep us engaged as the plot moves quickly from ghost to ghost. The cast delivers their lines with clarity, even through spitfire lyrics and we never miss a moment in the story."